Oliver Stone Profiles Power 'South Of The Border' In a new documentary, Stone goes behind the scenes with Venezuelan President Hugo Chavez but doesn't ask the hard questions. NPR's Robert Smith says "never has a revolutionary strongman seemed so lovable and cuddly." 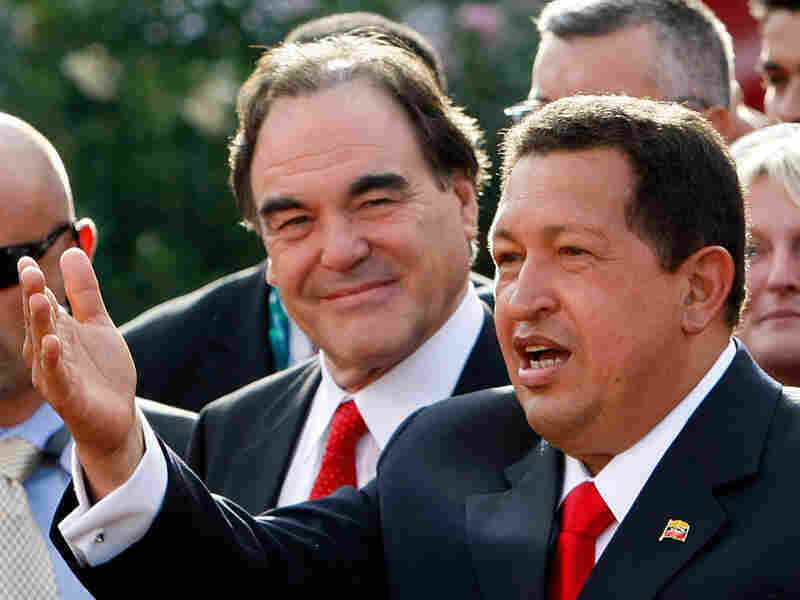 Director Oliver Stone (left) looks on as Venezuela's President Hugo Chavez acknowledges the crowd at the screening of the documentary film South of the Border at the Venice Film Festival in Italy. The New York premiere of Oliver Stone's new documentary South of the Border lacked that Hollywood red-carpet flair. In fact, the carpet was gray. The only red in sight was the controversial subject of the film: the socialist president of Venezuela, Hugo Chavez. But Chavez easily eclipsed the other lefty movie stars who showed up, Danny Glover and Susan Sarandon. Chavez strutted around in a tomato-red turtleneck. He mugged for the cameras. And showed off his Hollywood savvy: Always praise the director. "Oliver [Stone] with his genius, his nugget," Chavez said, grabbing the director and tapping his skull, "he was able to understand what was going on in South America: a revolution!" And in the Oliver Stone version of the revolution, there isn't much nuance. Stone seizes control in a directorial coup. And opposition isn't tolerated. "He's an underdog," Stone said. "I want to give him a fair shake, and I think the movie does that." Stone is known for feature films such as Platoon, JFK and Wall Street. But he does dabble in documentaries on political subjects close to his heart. He has focused in the past on Yasser Arafat and Fidel Castro. Chavez, the man who famously called George Bush "the devil" from the floor of the U.N., was a fitting revolutionary sequel. After a recap of Chavez's rise to power through coups and the ballot box, the movie turns into a political version of MTV's Cribs. South of the Border is framed as a rebuttal to the usual U.S. media caricature of Chavez. Stone plays clip after clip of newscasters referring to the Venezuelan president as a terrorist and worse than Osama bin Laden. Stone then starts to tell the other side of the story — and only that side. After a recap of Chavez's rise to power through coups and the ballot box, the movie turns into a political version of MTV's Cribs. Stone pops in on Chavez's life and basically hangs out with him. They tour the Presidential Palace, fly on the private jet. Stone brings Chavez back to his childhood home and makes him ride a child's bike. It collapses underneath the president, and everyone laughs. Never has a revolutionary strongman seemed so lovable and cuddly. And Stone, the man who became famous for questioning the official story, never leaves Chavez's embrace. Stone never asks a hard question. (Instead, he tosses out "Do you have any fun?" and "What time did you get to sleep last night?") Stone never brings up anything controversial. There is no talk about how Chavez revoked the licenses of private TV and radio stations. There is never any mention of the human rights concerns raised by Amnesty International. Stone never talks to any Venezuelan citizen about the leader. 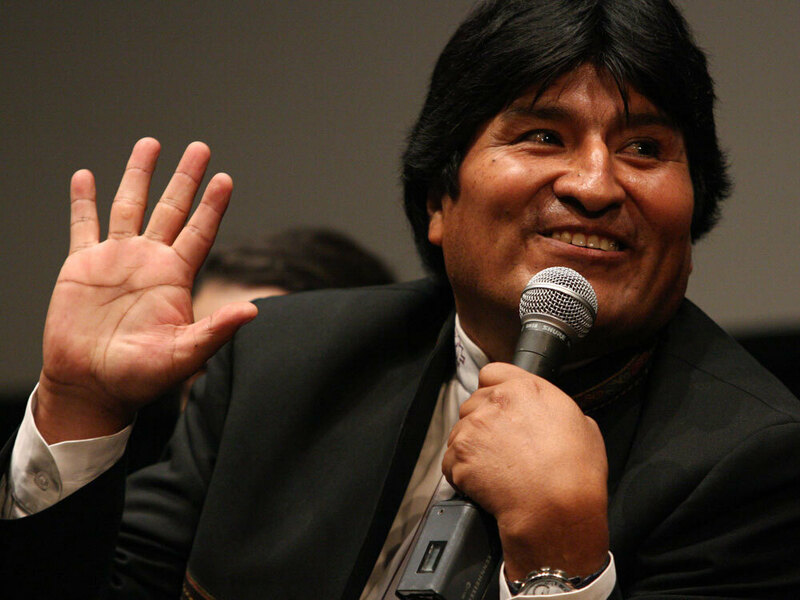 President of Bolivia Evo Morales responds to a question from the audience after a screening of South of the Border in New York on Wednesday. Stone gives the same kid-glove treatment to Chavez's allies. He plays soccer with the president of Bolivia, Evo Morales. He asks the president of Argentina, Cristina Kirchner, how many shoes she owns. At the New York premiere, the lights went up with a nice round of applause, but clearly the audience members most thrilled were the subjects of the documentary. Bolivia's Morales declared that it should run on CNN. "Every day," Chavez joked. "Welcome to the axis of evil," Morales said to the director. After the presidents and their security teams left the theater, I approached Stone and asked him what happened to the skeptical director of JFK, the guy who questioned the official story? Stone says he learned something from making that movie: If you try to argue every opposing viewpoint, it just confuses people. "I don't pretend that this is a three- or four-hour documentation of all the issues," Stone said. "If you want to deal in the 10 percent of negatives, and slice and dice your movie for that 10 percent, you're going to hurt the movie. That's not the point."